Okay, so this recipe is very similar to baked ziti, but I put my own twist on it, kept it super duper simple and renamed it Pepperoni Pizza Pasta. You can customize this in many different ways – use regular or turkey pepperonis, use regular or whole wheat pasta, sub ricotta for the cream cheese, add extra mozzarella, etc. Serve it with garlic bread and salad, or even some simple green beans. Boil pasta per package instructions. Add 1 tablespoon EVOO to water while boiling. Drain. Leave pasta in strainer and use same pot to heat up diced tomatoes. Stir in pepperonis, cream cheese, 1/2 cup shredded mozzarella, 2 tablespoons EVOO, dried basil, garlic salt and pepper. Pour into 13X9 casserole dish. 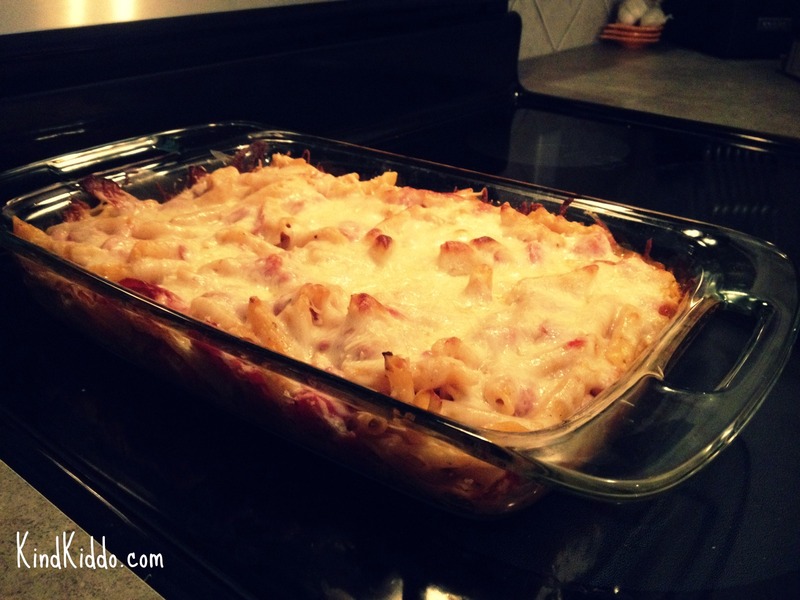 Bake at 375 for 20 minutes or until cheese is bubbling and just slightly browned on top.